XXVII, 414 p., 17,3 x 24,4 cm. With (German) contributions by Frank Grunert, Ludger Honnefelder, Matthias Kaufmann, Klaus-Gert Lutterbeck, Matthias Lutz-Bachmann, Thomas Marschler, Merio Scattola, Martin Schmeisser and Robert Schnepf. 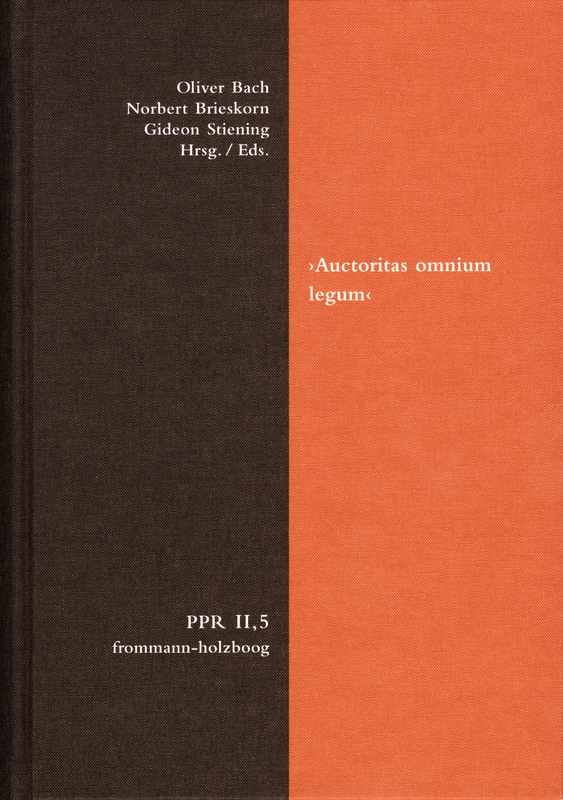 The ›Tractatus de legibus ac Deo legislatore‹ (1612) by Francisco Suárez is one of the most influential and most important systematic concepts of early modern legal philosophy. Alongside with Grotius’ ›De iure belli ac pacis‹ (1625) and Hobbes’ ›De cive‹, Suárez’ treatise significantly defines the systematic debates on political philosophy in the first half of the 17th century. The volume presents systematic studies reconsidering the relation of theological, philosophical and jurisprudential reasoning in order to constitute normative orders. It also introduced every single book of the whole compendium in ten articles.